18 leaves : ; 28 cm. 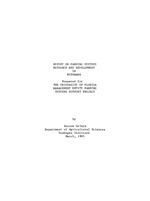 "Prepared for the University of Florida Management Entity Farming Systems Support Project." The Republic of Botswana is situated in the southern part of Africa. agricultural development pilot projects are being tested. the agricultural programs run by the Ministry of Agriculture and ATIP. human labor required to operate it. immediately at the start of the rainy season. 6. Alectra vogelii to incorporate resistance of A.
found by screening of cultivars. farmers' fields with and without subsidized inputs. future commercial farmers rather than the present small farmers. have to get green forages, and this is usually in October and November. appropriate time for the cultivation of her/his field. as green chops or as dry forages. Afrikander, Bonsmara, Brahman, Sahiwal, Simmental and Tswana breeds. distance of the grazing area. small laboratory at Sebele is not equipped to carry out these analysis. are added to the determinations carried out at the laboratory. IFPP covers an area of 23,000 ha of both arable and grazing areas. could be developed by IFPP. December, 1983). In both areas appropriate technologies are being tested. and methods of planting on yield of sorghum, millet and other field crops. in Mahalapy and Francistown areas. aids to agricultural demonstrators (AD'S) in training farmers. with good indigenous jacks to produce good draft mules. areas) use draft animals for plowing and pulling carts and sledes. farmers will have to be introduced to the use of draft animal collars. see plows with the coulters missing and the cutting edges badly worn-out. productivity of cattle is to be maximized. range improvement, introduction of range blocks, etc. management and improving performance of animals. branded with this combination of numbers and letters. system to be used by small farmers in the project regions. breeding programs or upgrading of the cattle population. could be initiated into proper management of their small stock. propagate the desired species of plants. adding three additional Batswana counterparts to the livestock team. development of agriculture in The Republic of Botswana. 2. APRU. 1983. Annual Report, MOA. 3. ATIP. 1983. Anual Report Number 1. 4. ATIP. 1984. Annual Report Number 2. October 1, 1983 to September 30, 1984.
report on the APRU/IFPP Cattle Survey, 1980-1983. Division of Arable Crops Research 1982-83. 9. Ministry of Agriculture, Botswana. 1984. Agrinews. V.15. No. 10.
rainfall zone, September 14-16, 1983, Harare, Zimbabwe. 12. USAID. 1981. Botswana Agricultural Technology Improvement Project.